Barefoot luxury consortium Coco Collection has teamed up with immersive experience brand, Edible Stories, to create an exclusive edible spa menu for people seeking a winter sun escape with a twist this year. Available from the award-winning Coco Spa at Coco Bodu Hithi and Coco Palm Dhuni Kolhu, this exclusive menu is sure to be a tempting treat, so come hungry. A popular destination with celebrities including British model, Adwoa Aboah and former England captain, John Terry, Coco Bodu Hithi epitomises barefoot luxury. Situated in the North Malé Atoll, the property boasts 100 villas surrounded by lush tropical vegetation and crystal clear waters which is home to an abundance of marine life. From tailor-made experiences to award-winning restaurants and the ultra-luxurious Coco Spa – Coco Bodu Hithi exemplifies attention to detail and sophistication in every respect. Coco Palm Dhuni Kolhu lies in the stunning southern waters of Baa Atoll, designated as a Unesco Biosphere Reserve in 2011, due to its incredible diversity of coral and fish life. 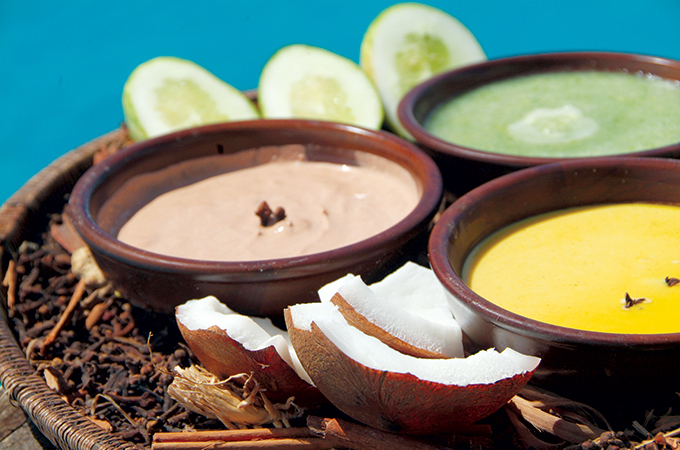 The edible spa menu will be available to all guests on Coco Bodu Hithi and Coco Palm Dhuni Kolhu soon. All treatments in the menu will use homemade spa products made entirely of edible ingredients such as turmeric, avocados, aloe vera, banana and kiwi. From fruity skin brightening masks to ice cream body scrubs, this menu offers a truly unique and exciting experience. The treatments have been specifically designed with superfood ingredients to help rejuvenate and detox your body and mind. Some delicious names in the spa menu include Coco Lassi Mask, Mango Smoothie Mask, Papaya Panna Cotta Mask, Coco Rice Pudding Scrub, Chocolate Cake Scrub, Coco Ice Cream Scrub and Neem Tea Mask, among others.